Do I Have to Cook Italian Sausages in a Skillet First to Cook Them in My Crock-Pot? Countertop slow-cookers are an unusually convenient way to prepare meals. Their slow, gentle cooking can tame even the toughest cuts of meat, and allow aromatic sausages and cured meats to infuse their flavors into the rest of the dish. Sausages can go directly into your Crock-Pot without any preparation, although there are a few advantages to precooking Italian sausages and other fresh sausages in a skillet before putting them in the pot. Fat-conscious cooks and diners are often reluctant to work with sausages. Each sausage is actually a carefully prepared emulsion of meat and fat, held together in suspension. If they're cooked gently, the fat remains in the sausage to keep it mild and flavorful. Otherwise, the fat cooks out and leaves behind a dry, crumbly and disappointing sausage. This creates a dilemma for health-conscious sausage lovers, who like the flavor but not the fat. Cooking out a portion of the fat ahead of time, in your skillet, often seems an attractive option. Precooking the sausages in a skillet provides a few very notable improvements. 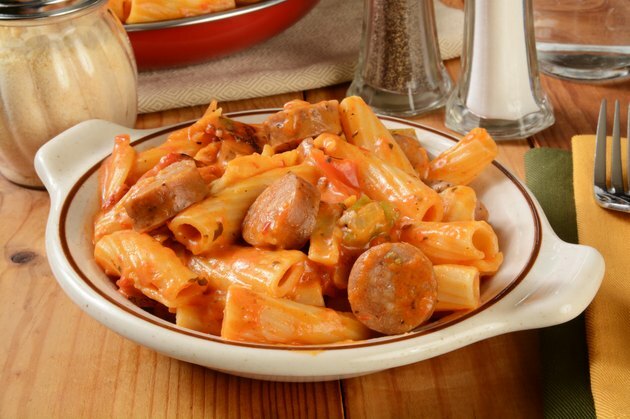 It renders fat from the outer portion of the sausage, reducing the quantity of saturated pork fat in your final dish. It also browns the pork and its casing through a process called Maillard reactions, which create a range of rich, savory flavors. This is a notable advantage, because the slow-cooker isn't hot enough to create significant browning. However, if you're not careful, you can overcook the sausages before adding them to your Crock-Pot. By the time the slow-cooker dish is finished, your sausages might be in disappointingly poor condition. Many chefs and butchers recommend precooking Italian or other sausages in water, wine or other liquids, rather than frying them. The liquid should be at a gentle simmer -- roughly 160 to 180 degrees Fahrenheit -- and the sausages should poach to an internal temperature of 150 F. At this point they're safely cooked all the way through and have shed some fat, but retain their juiciness. The slow-cooker will poach your sausages very effectively if you add them without this step, but the end result will be fattier. For the best of both worlds, poach your sausages, then brown them briefly in a very hot pan for maximum flavor. If you choose to add your sausages directly to the Crock-Pot without precooking them, keep them refrigerated until the last moment. They'll take time to arrive at a foodsafe temperature in the slow-cooker, and this way any potential bacteria won't get a head start. Pre-cooked sausages start off at a foodsafe temperature, so this isn't an issue with those. The rich flavor of Italian sausage, with its distinctive hint of licorice-like fennel, adds to the appeal of any cooked vegetable or bean dish. It's also excellent in tomato-based sauces, which develop a deep flavor if simmered for hours in the slow-cooker.